I usually don't pay much attention to contests in Japan as a) they always look like some kind of marketing scam and b) I just assume that with 120 million other people entering I don't have much chance. You know the ones, you see them in magazines and such and they always have a nice first prize, then a bunch of cheap second and third prizes like rice cookers and t-shirts or something like that. Well Kumi pays attention, and a good thing, as she managed to snag the first prize trip to Sapporo in some magazine contest! We got hotel vouchers, 2 tickets to a cow-milking, vegatable-picking, and cheese-making tour, and 40,000 yen in flight coupons, all on someone else's dime! We went up over the weekend, and since the tour was on Sunday, we had Saturday to explore and hang out in Sapporo. After checking into our hotel we opted for a short (30 minute) hike up Mt. 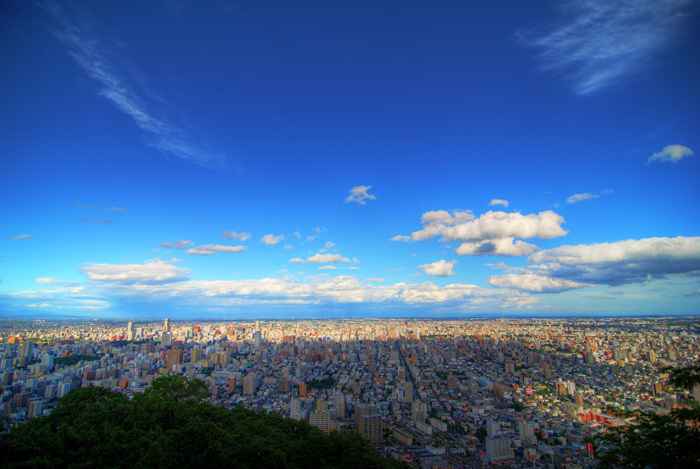 Maruyama which gives grand views of the city. It was still August when we went, but the weather in Sapporo was clear and warm unlike the broiling sogginess of Tokyo. in Hokkaido, humidity is just a story used to frighten young children. After a nice lamb barbeque dinner, we headed up a different mountain (Mt. 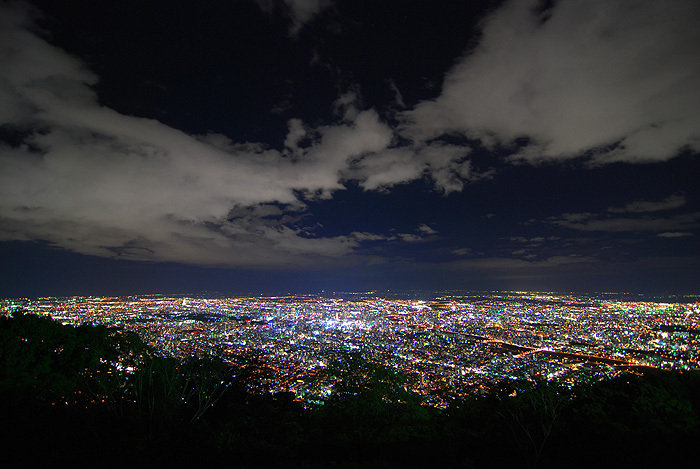 Moiwa) this time by cablecar to take in a view of Sapporo at night. It was actually pretty chilly up here at night! I was very impressed by our hotel. 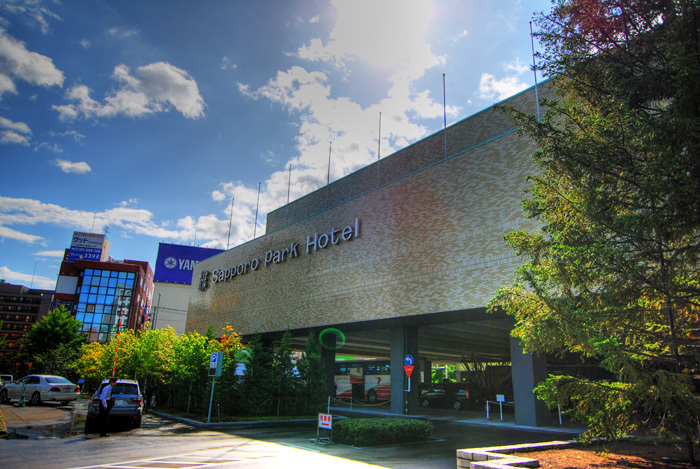 You figure a free tour is going to stick you in some cheap business inn, but the Sapporo Park Hotel was high class! Excellent service, nice rooms and an amazing breakfast buffet in the morning. The hotel seems to specialize in conferences of every type. On the day we arrived, the hotel was playing host to a dentist convention, so Kumi and I made dentist jokes all day. The next day there was a convention of blind people and their seeing eye dogs (the dogs were all wearing plaid jackets of different colours for some reason). We decided to stick with the dentist jokes though. 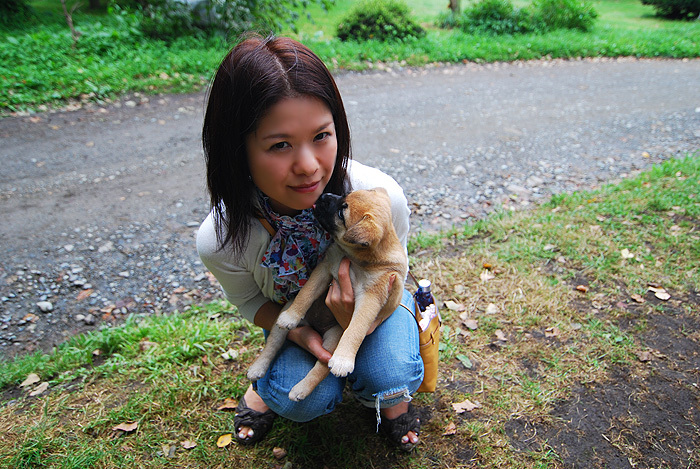 Then on Sunday we were picked up by a huge bus and headed off to Hakone Farm (not to be confused with the Hakone near Mt. Fuji). The bus was big enough for 50 people, but only 9 people joined the tour including ourselves. We rode in peace and comfort. We pulled into the farm parking area and right on schedule, it started pouring rain, so we did the cheese making tour first in the hopes that it would pass by the time we were done. 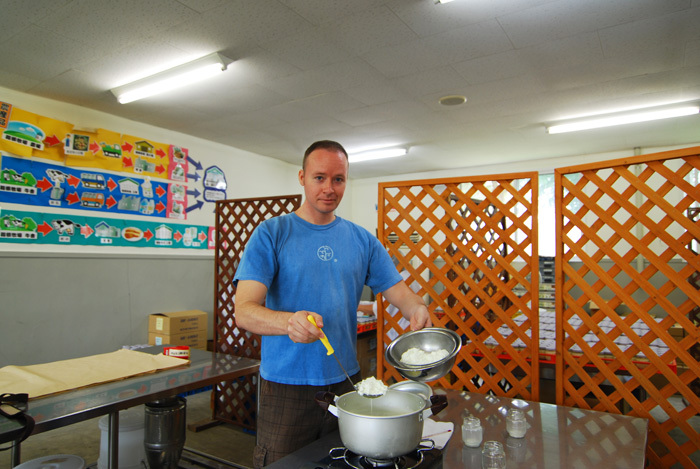 Here's Kumi beginning the process of pouring cream into a big pot. After pouring in the cream, add some salt, then heat it all slowly until it reaches 89 degrees celsius. After that add some lemon juice (you heard me) to induce clotting or something like that. Stir very, very slowly and you'll eventually end up with curds. Squeeze the the juice out of the curds, stuff it in a paper pot, throw it into the fridge, and voila, you've got cheese. We ate it for lunch with a ton of steak, sausages, vegetables, beer and crackers. All free of course. Woo! Before you start the tour you get to choose what you want to make. Some people chose to make butter, and others chose to make sausage. Butter sounded boring to me, and sausage sounded scary, so cheese it was. Here I am draining some soggy curds. And the rain passed to be replaced by blue skies! Next on the list was cow milking. I admit to being a bit weirded out by it, but I gamely gave a few squeezes and out came some milk. There is a technique to cow milking. You have to (gently) squeeze the teat from top to bottom for milk to come out. If you put pressure on the whole thing at once, milk might shoot back up into the udder. For obvious reasons, cows don't like this too much and will let you know it by various means such as bellowing, kicking you in the head, etc. We drank the milk for lunch too, and it was delicious! 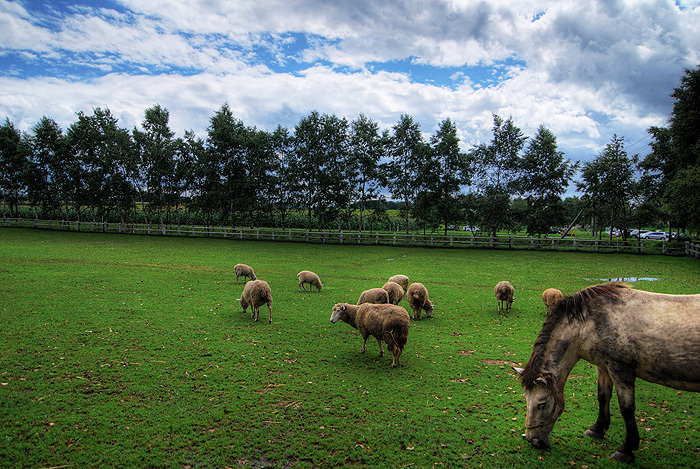 The farm was full of sheep and horses which were munching contentedly on grass. Since they were all standing still I decided to shoot an HDR. After the huge lunch I mentioned above, it was vegetable picking time. We were supposed to be able to pick corn, potatoes and melons, but due to most of the fields being soaked, we were only allowed to pick potatoes. They kindly gave us plastic bags to put on our feet, and gloves with which to dig in, and we set to! They gave us all some plastic bags and told us to pick at will, and that they'd send us everything we picked in a box right to our houses (again free). 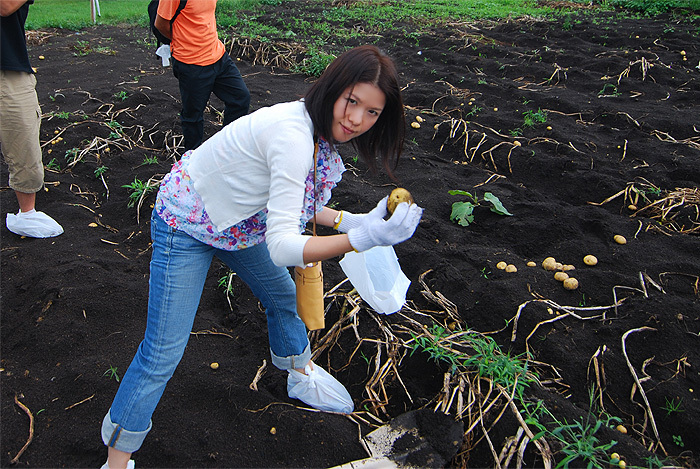 Taking them at their word, Kumi and I dug up about 200 potatoes between us. It's been about 2 weeks now of potatoes every night and we're not even half way done. Fried, roast, baked, mashed, you name it, we've tried it! As an added bonus they also stuck 6 ears of corn and a massive squash in our box. Potato picking may have been my favourite part. There was just something thrilling about it, like digging up treasure. After that we had about 30 minutes of free time where we wandered around the farm, played with puppies, ate ice cream, and generally enjoyed ourselves. Maybe the best tour I've been on in Japan!